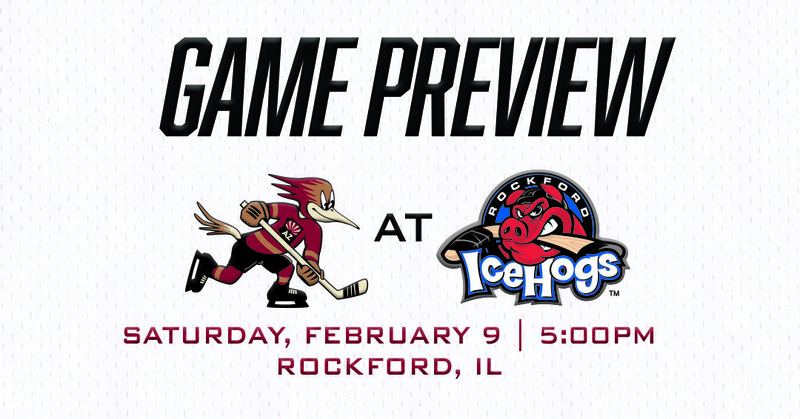 The Roadrunners will look to respond from Friday evening’s 3-1 loss as they meet with the Rockford IceHogs for the final time this regular season tonight at the BMO Harris Bank Center. For the fourth time in their last five games, the Roadrunners were held to just one goal. They enter the night with a five-game losing streak (0-4-1-0), the longest since March 12-25 of 2017, when the inaugural club also went on a 0-4-1-0 skid. Lane Pederson, who punched home Tucson’s lone goal last night, is now the club’s active leading goal scorer. His tally, which also served as his 13th of the campaign, gave him a new single-season career high in goals and points (27). He comes into the evening with points in three straight games and seven (3G, 4A) in his last seven contests. The IceHogs extended their win streak to six games last night; only the Syracuse Crunch (8-0-0-0) and the Bakersfield Condors (11-0-0-0) have a longer outright string of consecutive wins than Rockford right now. Maintaining fourth-place in the division tonight will be of interest storyline-wise. The Colorado Eagles could surpass the Roadrunners for the grouping’s final playoff spot with a win over the Stockton Heat tonight, who they host at the Budweiser Events Center at 7:05 PM MST, coupled with a Tucson regulation loss. FRESH FACES: Forwards Emil Pettersson and Jeremy Gregoire made their Roadrunners debuts last night, and against a familiar opponent. While playing with Milwaukee, the two played in the same division as Rockford. Pettersson, who finished Friday with two shots registered, has three assists against the IceHogs this season, all in a Milwaukee uniform, while Gregoire, who put three pucks on net in his debut, has one goal scored, that coming on December 19. Can the two new names help boost the Roadrunners’ offense in tonight’s finale against Rockford? NUMBERS GAME: The IceHogs come into the night dead-last in the AHL in offense, averaging a league-low 2.36 goals per game. Rockford, however, is dangerous when netting the game’s opening tally, posting a 16-5-0-2 mark when doing so. 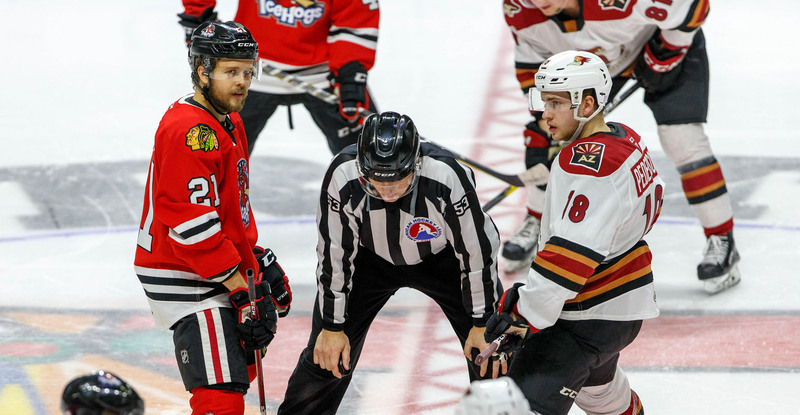 The Roadrunners, 18-3-4-0 this year when scoring three or more goals, will be in good hands if they can hit that total tonight; the IceHogs have eclipsed three regulation goals just once during their current six-game win streak. Rockford is notably stingy in its defensive end, allowing opponents an average of just 2.72 goals per game. 25 TO GO: There are 25 games remaining on the Roadrunners’ regular season schedule from here on out; 13 on the road, and 12 at home at Tucson Arena. Seven games will be played against opponents out of the Central Division, the other 18 will stay within the Pacific. The Roadrunners will face the Colorado Eagles and Iowa Wild four times each, more than any of their remaining opponents. SEVEN-HUNDRED: Former Roadrunners captain Andrew Campbell will play in his 700th American Hockey League game tonight, becoming just the 74th player to ever reach that milestone. 60 of Campbell’s 699 games to-date have come in a Roadrunners uniform. You can catch tonight’s action at Brother John’s Beer Bourbon & BBQ, the official watch party location for all Roadrunners road games during the 2018-19 season. A live telecast is available on AHLTV; Roadrunners play-by-play broadcaster Adrian Denny will have the radio call on AM 1450 Fox Sports Tucson, with coverage starting at 4:45 PM.